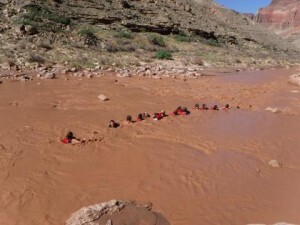 This Grand Canyon rafting trip was on my husband's "bucket list", but the kids and I were very apprehensive about the trip. It didn't take long before we realized that this was going to be an amazing experience. The two guides Evan and Kurt on our raft (plus Jason and Lindsey on the other raft) had a huge part in making it a perfect trip. They are top notch guides and very special people. Riding the rapids beats any roller coaster ride I have ever been on. Nature is absolutely breathtaking and there is constantly a new experience around every bend. Many cool hikes to Indian ruins, waterfalls and beautiful nature. Learn a lot about the geology of the Grand Canyon and the history of the Indians and explorers. Beautiful campsites where you can sleep under the stars. I never thought that I would eat such wonderful food while camping. We made new friendships with other guests and the guides. Western is an impressive tour company - they have thought about everything down to the smallest detail to make you comfortable, safe and able to enjoy your vacation to the fullest.